Until the 1990s, 20 percent of the badger population in the Netherlands were killed every year on the country's highways. As their habitats were destroyed - for example, by intensive farming - the animals had fewer places to live and no easily-available food. When they ventured away from their setts to hunt for food, they often had to cross roads, where they were usually killed. Early fences and tunnels to prevent road kill and allow movement were not highly successful. The fences were too low and were not anchored in the ground, allowing the badgers to climb over or crawl under them and onto the road. The fences also frequently developed large holes, so they offered little protection. These deficiencies were corrected in later projects. Near the town of Heumen, for example, the national Ministry of Transport constructed five tunnels under the highway and built higher, stronger fences. 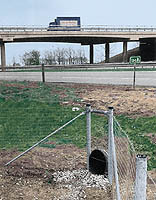 Escape gates were put in the fences at one-kilometer-intervals to protect any badgers that ended up on the road. These meant the badgers could get off the roads, but couldn't get back on again. That's not all. Workers created a "green network" between the badger sets, and Heumen Municipality incorporated rules for protecting the setts into its by-laws. Together, the fences, tunnels, green space, and habitat protection have resulted in nearly doubling the local badger population. As for the badgers safely crossing the road...Infrared cameras and tracks in sand and ink beds demonstrate the animals are using the Heumen tunnels almost every night. Foxes, rabbits, and hedgehogs also travel through them. This badger tunnel under A73 near the town of Heumen was the first to be built in the Netherlands. As well as the vitally-important result that it has reduced the number of road traffic accidents; it has also meant that habitats and territories can be linked across both sides of the motorway. Similar successes have been reported on badger-tunnel projects in other parts of the country. In fact, badger tunnels in the Netherlands have been so effective it is now standard procedure to consider them for every new highway project. Because so many badgers are killed on the roads here in the UK too, the British highways people are increasingly providing tunnels under roads to provide safe passages for wildlife. As well as helping the local wildlife, this can also cut down the number of road accidents too. In fact, one of the first British purpose-built tunnels was built for badgers as long ago as 1976. Under the M5 motorway (near Wellington in Somerset, England), the idea of the tunnel was that it should prevent them from being run over by traffic. The tunnel was specially located to intersect a badger path leading from the main sett to badgers feeding grounds. At first this safe, underground route did not really seem to be working, as the badgers studiously avoided using it. Despite the fact that the tunnel was specially designed to save badgers' lives and to prevent accidents, and that it was filled with suitable bait, and badger smells (called musk), they still didn't use it. It was only when the badger family had several cubs to rear (and needed better food supplies) that they officially opened the site. All in all, it took the badgers nearly three years to open their tunnel, although they quickly claimed the territory as their own, by placing latrines at either end. That said, the tunnel has certainly saved the lives of badgers and prevented many potential accidents on a busy section of motorway - money very well spent. Of course, with the construction of any new (or widening an existing road), culverts will normally be constructed to allow for surface water to be drained away - either as new small soakaways, or to accommodate existing water courses, like streams, river and drains. Given that these will be constructed anyway, it is a relatively easy task to construct them to allow the safe passage of wildlife species as well as water. If a semi-circular galvanized corrugated steel culvert is being built to take a stream under an embankment, then the culvert should be widened to allow the maximum expected flow of water. Along one or both sides of the culvert should be a raised platform which will allow the badger to use the culvert without entering the stream or river. The platform needs to be higher than the maximum expected water level and roughly 60cm wide. As well as being "badger-friendly", such a platform can also prove useful during the tunnel construction process, and for later maintenance tasks. It can also be useful to maintain the structural strength of the culvert in the event of major flooding; and provide a chance of an escape route in the event of children being too inquisitive for their own good. If a tunnel is needed through en embankment, the tunnel needs to be at least 60cm in diameter, and preferably use concrete drainage pipes. These should be laid on a gentle slope to allow water to to run off or through, so the tunnel is not waterlogged. If the tunnel has too steep a slope, wildlife will tent to slip on the smooth concrete floor. If the tunnel will have any tendency to collect water (for example due to ground conditions or because its lowest point is underground), it should have a substantial soakaway. Drainage ditches will also pose a potential obstacle for wildlife species; and these may need to be fenced off accordingly; and small wildlife installed to cross the ditches in safety. As in the case of tunnels, badger-proof fencing should direct badgers towards the culverts. Suitable planting schemes may be used around the tunnels or culverts entrances or exits, if the badgers are felt to be vulnerable to being spotted at that point (for example, in residential areas). Ideally, the siting of these over or underpasses should relate to the position of the local setts and badger paths, and particularly where a hedgeline or some other linear feature would lead the badgers to the tunnel entrance. Badgers usually take some time to start using tunnels (sometimes measured in years!). To help them start, some people have laid a scent trail of anethol to the tunnel entrance or have pulled the bodies of accidentally killed badgers through tunnels to lay badger scent in the pipe. If you are absolutely certain of the group's territorial boundary, scent trails of bedding and dung from that particular group of badgers may help lead the badgers through the tunnel, as will sugar-coated peanuts and other badger treats. The earlier the authorities are told of the need for badger tunnels, the more likely it is that they are to be included in the plan. This is a key area for local experts, like the local Badger Groups. Badgers will be tempted to use the tunnels only if they can be made more attractive for the badgers than other crossing points. In the vast majority of cases, badgers would tend to cross over the road (rather than use the tunnel), and for this reason, extensive fencing will be needed in order to keep the badger off the road, and to direct them towards the tunnels. In the past is had been suggested that appropriate tree planting schemes would discourage the badgers from getting onto the carriageway. The recent evidence is that secure, badger-proof fencing is the ONLY effective way. With new housing estates, badgers will be very reluctant to use tunnels and have to be forced to do so. Long lengths of substantial badger-proof fencing is rarely practical for large housing estates - especially if residents leave the badgers another route through gardens, because they leave garden gates open. The most successful option is to install a wide (e.g. 5 metres) animal "underpass" within a natural gully across the estate (this may need proper drainage if it may be prone to flooding). In using the word "underpass" we really mean a passageway which has a naturally-safe feel to it, which is concealed by vegetation on the side and, to some degree, above (or use tall screened fencing instead). Sections may have concrete roofs (for roads, drives and paths), although much of it may be open to the air. The underpass should be so attractive to badgers that they choose to use it rather than going above ground, which normally means siting the underpass on their preferred route. Whilst being wide, it should also have a low roof (to prevent people and children trying to use it), and it should be concealed by substantial dense planting schemes. Any visible areas of the underpass should remain unlit - both by street lights, and by residents security lighting and vehicle lights. Walls and fences should direct badgers and other wildlife towards the entrances of the underpass. In the early days, weeks and months the passageway may need to be groomed by human helpers. This may mean encouraging the badgers into the underpass, by strategic food drops, or by dropping badger dung or musky soil into it; to encourage them inside. For the underpass to stand a good chance of working for badgers, it should form part of a wide greenway for the badgers, with plenty of cover and no public access. Indeed, the ideal example probably remains unknown except to the most observant residents. As well as large badger tunnels and underpasses, similar schemes can also be built for amphibians (like, frogs, toads and newts) too. In the cases of large underpasses (like this one under a road in the USA); the roof space can be fitted with nesting boxes to allow the space to be used by birds or bats too.